What is Hematite? Hematite is composed of iron oxide. Though it often appears metallic, it is only magnetic when heated. It has a hardness of 5, and is one of the most common minerals. What color is Hematite? It is usually black or metallic gray, but can also be brown, red, or iridescent. The name comes from the Greek word “haima” for blood. This is because Hematite streaks red and adds a redish tint to other stones. Where does Hematite come from? It is found in many locations, the finest include Brazil, England, and the United States. What are the metaphysical properties of Hematite? 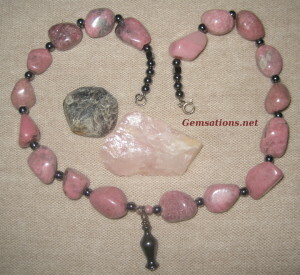 Hematite is said to establish grouping and to promote common sense. Being named for blood, it is also said to strengthen the circulatory system and aid with blood disorders. How do I clean and care for Hematite? As with other stones, avoid chemicals and harsh blows. You can clean and polish it with a smooth cloth. What colors do Garnets come in? Garnets are usually considered a deep red stone, but in reality, Garnets come in a wide range of colors and types. In fact, Garnets are available in every color except blue. What are the types of Garnet? Six different types of Garnets are used as gemstones. Pyrope Garnets are the most famous. They are blood red and usually flawless. 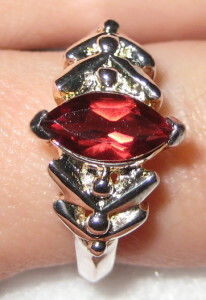 Almandine Garnets are the most common. These are very dark, nearly black, but the popular cut allows more light through and makes the stone appear brighter. Spessartine Garnets are usually orange, and are less common. Grossular Garnets have the widest variety of colors. They are naturally colorless, but various mineral inclusions add vibrant colors. (The gemstone Tsavorite is the green form of a Grossular Garnet.) Andradite Garnets are the most lusterous, and offer more fire than a Diamond. Uvarovite Garnets are emerald green and are the rarest form. They only occur in small crystals and are rarely used in jewelry. Where do Garnets come from? Garnets are found in many countries all over the world. What are the metaphysical properties of Garnet? Garnets are said to increase health, imagination, and fidelity. They are the January birthstone, and the 2nd and 6th wedding anniversary stones. How do I clean and care for Garnets? Clean Garnets with a soft, dry cloth. Protect from scratches, blows, chemicals, and extreme temperatures. Emerald is one of the most beloved and valued gemstones due to its beauty, durability, and rarity! It is a form of Beryl. What color are Emeralds and why? Beryl usually found in green, but it can also be found in other colors, such as pink. Pure Beryl is white, and the green Emerald form is created by trapped Chromium within the stone. Emeralds’ value depends much on the color, darker green is worth more. A very pale Emerald will simply be called Green Beryl, and another blue-green form is Aquamarine. Is there such thing as a flawless Emerald? A flawless Emerald is extremely uncommon, and very valuable because this gem is notorious for flaws. In fact, many collectors prefer flaws to help prove authenticity. Emeralds are usually treated with oil to help minimize flaws. Where do Emeralds come from? The most prized Emeralds come from Columbia, while Brazilian Emeralds may be lighter. The gem is also found in other countries including Zambia, Australia, and the United States. In fact, when visiting North Carolina, one can gem mine at natural Emerald mines! What are the metaphysical properties of Emerald? Emerald is said to bring love and wealth. It is the May birthstone, and the anniversary stone for the 20th, 35th, and 55th years of marriage. How do I clean and care for Emeralds? Emeralds should be cleaned with a soft, dry cloth. Avoid drastic temperature changes, chemicals, and ultrasonic jewelry cleaners. Extreme temperatures and blows can create internal cracks. Color: Diamond color is graded alphabetically from D to Y, measuring color saturation. “D” indicates a pure Diamond with absolutely no color, while “Y” indicates a deep yellow or brown Diamond. “Z” is reserved for Fancy colored Diamonds. Cut : The cut of a Diamond indicates its shape or faceting. Cut is extremely important to the value of the stone, because one false facet can limit the full effect of the Diamond. The most preferred cut is brilliant which best highlights the wonderful fire of the gem. Other cuts may be less valuable. Clarity : The clarity grade is based on the size and noticeability of flaws and inclusions in the Diamond. Carat Weight : This is the size of the Diamond. 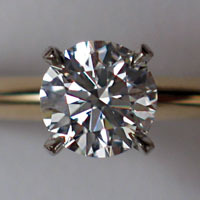 Usually, a larger weight is more valuable, but this also depends on the other “Cs.” A carat is .2 grams, or .007 ounces. The larger the Diamond the more each carat is worth. For example, a single five carat Diamond would be worth more per carat than five separate one carat Diamonds. What are Diamonds? Diamonds rate a 10 for hardness, and are the hardest substance on Earth, thus they hold up well in jewelry. In fact the name comes from the Greek word, “adamas” meaning invincible. Diamonds are actually not as rare as most people believe, but only a small portion are fine gem quality and make it to the market. What colors do Diamonds come in? The most desirable Diamonds are completely clear, but many colors exist. Fancy Diamonds can be red, blue, black, green, and more. Where do Diamonds come from? The largest exporter of Diamonds is South Africa, but they exist in many places around the world including Australia, Canada and even Arkansas! Click here to see more about grading Diamonds. What are the metaphysical properties of Diamonds? Diamonds are said to bring purity, harmony, and love. They are the April birthstone, and also the anniversary gemstone for the 30th and 60th years of marriage. Diamond jewelry is the recommended gift for the 10th year of marriage. How do I clean and care for Diamonds? Diamonds are generally very durable, but as usual, take care to protect your gems from blows. They should be stored separately, because they can scratch other surfaces. What is Citrine? Citrine is a form of quartz (the same family as other quartzs and Amethysts.) It’s hardness rating is a 7. What color is Citrine and how does it get that way? The name for Citrine comes from “kitros,” the Greek word for yellow. Pure quartz is clear, but the Citrine form derives its color from iron trapped inside the stone. 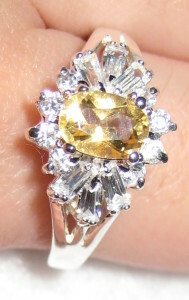 The finest Citrine is naturally light yellow, but often Citrine is created by heating pale Amethyst until it is yellow. In fact because the two stones are both color variations of quartz, they can even co-exist in the same stone as Ametrine. Where does Citrine come from? Citrine is found naturally in many countries including Brazil, Madagascar, Spain, and the United States. What are the metaphysical properties of Citrine? Citrine is given as a symbol of youth, hope, and fidelity. It is said to cleanse the body, and aid in tissue regeneration. It can be used as the November birtstone, and is also the anniversary stone for 17 years of marriage. How do I clean and care for Citrine? Clean Citrine in warm water with a mild soap. Beware of chemicals and other cleaners that can discolor it. Citrine can easily be scratched. It may change color if left in direct sunlight. What is Chrysocolla? 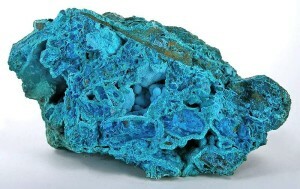 Chrysocolla is a relatively soft mineral, with a hardness of 2-4. It is usually mixed with another stone for stability, often Quartz. What color is Chrysocolla? Chrysocolla is a gorgeous bright green-blue stone that is often mistaken for Turquoise. In fact, Chrysocolla is currently more valuable. Where does Chrysocolla come from? This stone is frequently found in the American Southwest, and large deposits are found in Chile. Its presence is indicative of nearby Copper. What are the metaphysical properties of Chrysocolla? Chrysocolla is said to promote clear communication and creativity, also to relieve ulcers and arthritis. How do I clean and care for Chrysocolla? Chrysocolla should not be submerged in any liquids, but can be carefully wiped off with a damp, soft cloth. (Use distilled water.) Avoid ultrasonic jewelry cleaners, and all chemicals. Wear with care to avoid cracking and chipping. What is Aquamarine? Aquamarine is a member of the beryl family, as is Emerald. This gemstone offers excellent wearability due to its hardness of 7.5. Where does Aquamarine come from? Most Aquamarine comes from Brazil. What are the metaphysical properties of Aquamarine? Aquamarine is said to bring love and mercy, calm nerves, and ease depression. It is the March birthstone, and the anniversary stone for the 16th and 19th years of marriage. How do I clean and care for Aquamarine? Aquamarine can be cleaned in a professional jewelers ultrasonic jewelry cleaner or with sudsy warm water and a soft brush. It is a strong stone, but as always, protect your gems from scratches and blows. 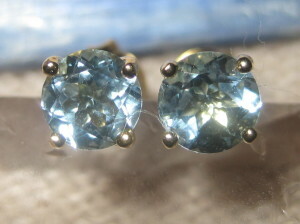 Aquamarine can become paler if left in the sun. What is Amethyst? Amethyst is an extremely versatile and wearable gemstone with a hardness of 7. It is a quartz stone -the same family as citrine and other quartz varieties. What color is Amethyst? 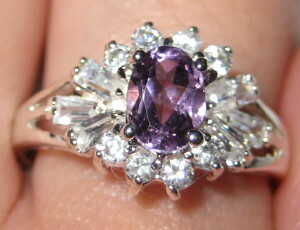 Amethyst comes in shades of purple and violet. The value of Amethyst rises with its depth of color and transparency… darker, clearer Amethyst is more desirable for jewelry uses. This gem can be just as beautiful in paler states, or in its raw form with bands of purple. Where does Amethyst come from? Amethysts are found in many countries, including Brazil, Bolivia, Uraguay, Zambia, and the United States. What are the metaphysical properties of Amethyst? Amethyst symbolizes sincerity, peace of mind and security. It is the February birthstone, and the wedding anniversary stone for the 4th and 6th years of marriage. How do I clean and care for Amethyst? Amethyst can be cleaned in an ultrasonic jewelry cleaner, or with warm sudsy water and a soft brush. It is a relatively sturdy gem, but as always, treat your jewelry carefully. What is Amber? Amber is an organic gem that develops from fossilized tree resins, and often contains the remains of insects and creatures that were trapped inside millions of years ago. It has been valued and used as an adornment for thousands of years, longer than most other gems. Modern Amber is often heat treated in a process warms tiny air and liquid pockets inside the gem creating “star spangle” inclusions. What color is Amber? Amber is usually found in yellows and browns, but can also come in greens, and more rarely blues and violets. The colors vary depending on their origin. For example, Sicilian Amber is usually dark red or orange, while Eastern Europe yields brownish yellow. Burmese Amber is dark and fissured. Where does Amber come from? Typically, Amber is imported from the Baltic countries, but can be found in many different countries, including the United States. What are the metaphysical properties of Amber? Amber is warm to touch, and easily attracts static electricity, thus early civilizations believed it was magical. Amber has been used as a healing stone and to protect against evil. How do I clean and care for Amber? With Amber and other organic stones, it is important to avoid excessive heat and chemicals, such as perfume or hairspray. These can leave a white coating. Amber should be stored so that it does not rub against other gems to avoid chipping. Never use an ultrasonic or steam cleaner which can shatter the stone… Use lukewarm water and a flannel cloth instead.